Sometimes, when I feel in a funk, I nurture my inner anglophile and I feel better. Try it sometime. My technique is to turn on some good ol’ Doc Martin, drink tea, and–when I get serious–make some clotted cream. I also flash back to our road trip through southwest England two summers ago. Considering I have some cream clotting up nicely in the fridge at the moment, I decided I would pull you into my flashback with some photos from the journey. Enjoy! We began our journey in Oxford where my sister had just finished her study abroad program. Needless to say, it was very grand. Detour in the Cotswolds. Yes, places like this actually exist. Getting our Jane Austen kicks in Bath. Getting our Roman kicks at the Baths in Bath. My Father holding the land of his forefathers. Thoroughly wowed by Wells cathedral. PROOF! We found my great great great grandparents’ grave! That’s what I’m talkin’ ’bout. Devon Cream Tea. As I’ve mentioned, I am in the midst of reading many books at once. Not the best habit, but little else feeds the mind or fuels the creativity so well as a variety of voices sharing their wisdom. Therefore I’m doing a series sharing tidbits from these works in the hope it gives you some mental fuel. This is Part 3. See Part 1 on Friendship. Part 2 on Philosophy. Part 3 on Poetry. I laughed, but I was not surprised. Both Josh and I have read a good deal about the renowned Disney code of customer service. They excel at making sure no trash stays on the ground, that no backstage door is ever left open, and that no two cast members in the same costume ever appear in the same place at the same time. They guard that sense of magic to a frightening level, even to the point that they would rather clean up vomit in the inside of Jiminy Cricket’s mask than let a child see the human within. “The Walt Disney Company may be the clearest example of an experience business, and we should not assume that it is only about entertainment. Experiences are deeper and more meaningful. They imply active participation, not passive consumption, which can happen on many different levels. Sitting with your three-year-old daughter as she sings along with The Little Mermaid is an experience that goes well beyond entertainment. A family trip to Disney World may be quite stressful…but most visitors remember it as one of the great experiences of family life. Brown goes on to show how Whole Foods, Virgin America Airlines, and the Mayo Clinic have benefited through engineering their customer’s experiences, proving that it is not just a feature of entertainment. Any of us who have patronized these companies can attest that they feel different, and they feel good, thoughtful, and respectful. They make it easy for consumers to engage with their services. These companies have correctly identified, empathized with, and acted on these feelings, and therein lies their success. I hope you find this discussion empowering. This paradigm shift might be a little tricky, as it is easy to say, “I have a great product, and people should want this product because it is great.” The problem is that this is not enough. People want to know why your product is great for them. They want to enjoy the process of learning about your product, purchasing your product, and experiencing it in action. This might be overwhelming, but this is actually good news. Products might not sell themselves, but great experiences will. You want repeat business? You want people getting excited about what you do? I’ve been to Disney World three times, and I expect to go many times more. Whole Foods might be painfully expensive, but I still tingle with culinary possibility just by walking through the door. Why? They’ve hit that emotional resonance. They’ve created a great experience. And so can we. For a long time my family, and especially my father, dreamt of sailing in the British Virgin Islands. Last week we realized that dream. We sailed from island to island, idyllic beach to idyllic beach, wonder to wonder. It felt like a completely separate reality, an alternate universe. At one point I just started laughing like a Mad Hatter because, try as I might, I could NOT believe I really was there. Either it didn’t exist or I didn’t. I wasn’t even sure who I was. All that mattered was that beach. The BVIs are particularly well suited for this type of travel as the islands are all relatively very close together. We visited six in a week. Today, I want to tell you about Virgin Gorda, named so supposedly by Columbus who, classy guy he was, thought the island looked like a fat woman on her side. But I digress. My point is that Virgin Gorda is home to a small national park known as The Baths. Have you ever wanted to be 10 years old again? To run wild and climb all over stuff and splash around in pools of warm water and make sand castles out of perfectly white sand? This dream can come true. The Baths are a wonder made up of enormous boulders nature somehow managed to stack on top of each other making makeshift caves right by the waters edge. A pathway of sorts leads you through a labyrinth of crevices and caverns, and it didn’t matter whether the people I saw were eight or eighty, they all had the same broad grin stretched across their face. All the inner children come out to play at The Baths. God made us a playground, and none of us were going to waste it. Here are some pictures of our explorations of The Baths. They hardly do it justice. I just wanted to make sure you all added this place to your list of dream destinations. After all, travel is one of the best tonics to stimulate our imaginations. The world is big and fascinating and beautiful! Get going! I did not make these up. In case you missed it, two weeks ago National Geographic posted this article about the findings of a lost civilization in the jungles of Honduras. This article made me flash back to It’s a Wonderful Life when the young George Bailey tells his future wife, “I’ve been nominated for the National Geographic Society! Only us explorers can get it!” I love his optimism in that scene, and I think we need to stoke that optimism of discovery in ourselves. This article reminds us that there is hope for our inner explorers after all. Cheers! Happy Birthday to me! I am 29 today. 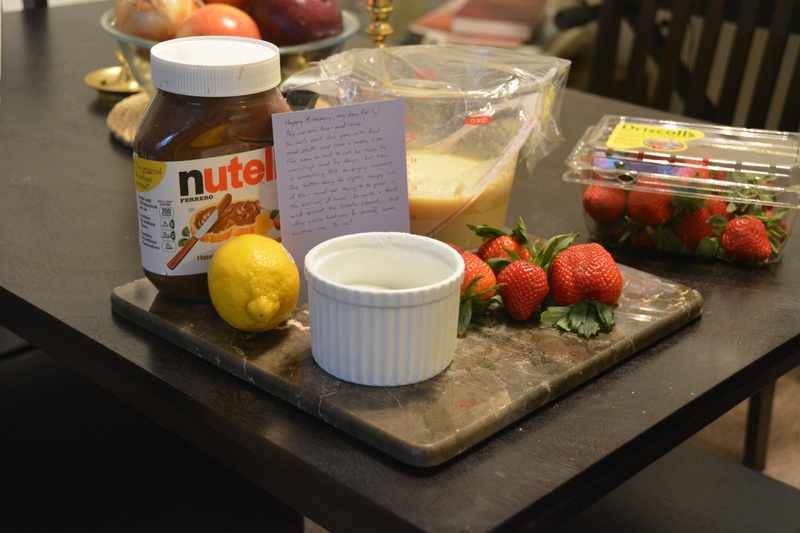 I woke up this morning to discover my hero of a hubby had my favorite breakfast of strawberry nutella crepes ready to go. Last week I was visiting some friends and wanted to make them something delicious for breakfast. I had all the stuff to make this crepe recipe, which is by far the best recipe I have found for this french staple (By the way, if you don’t have brandy, remember that sherry, bourbon, and rum also work; play with the amounts). But what to put inside the crepes? I hunted through their kitchen. No fresh fruit. But what ho! They had an enormous amount of canned peaches. I decided to turn this into a challenge. I sliced up the peaches and simmered them in bourbon, water, and sugar. When they became a little more tender, I added a splash of vanilla. Now for the topping. I searched their fridge. They didn’t have regular cream. They did however have sour cream. I grabbed that, mixed it with milk, sugar and bourbon in a bowl and played with the amounts until I had slightly tangy, slightly sweet creamy drizzle to top the crepes. I’m rather proud of myself. Give it a go! Holy cow, was this easy and spectacular. I’ve never been much for sorbets. Not when there is chocolate to be had. But this sorbet made with fresh squeezed oranges won me over big time. Though we have an ice cream maker, we didn’t end up using it. We just put the mixture in a large ramekin waited for it to ice over in the freezer. Doing it this way gave the sorbet the consistency of an italian ice, which in some ways is more fun than smooth sorbet. We made two changes to this recipe that, I believe, made it a true show stopper. First, we added pieces of orange rind to the simple syrup, giving it a pang of orange zest. Secondly, we added St. Germain liquor right before the mixture went in the freezer. Nom Nom Nom. As you may remember, I wrote about the Nashville ice storm that stopped the city in its tracks for a week. What it also did was postpone the New Orleans Fat Tuesday dinner party I had planned. The other night we made up for it with shrimp etouffee and buttermilk beignets. 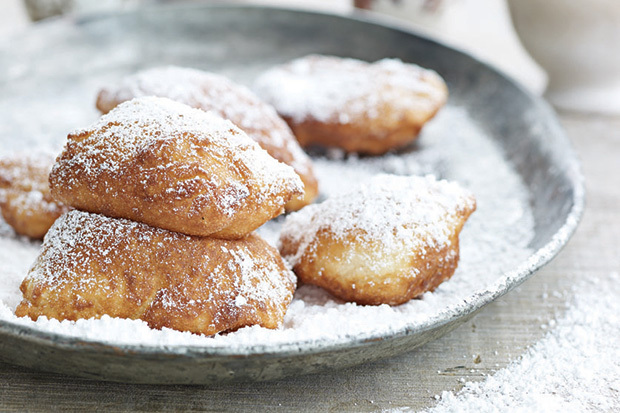 I have had mixed results making beignets from scratch, but this recipe is a keeper. I’m pretty sure one of my guests ate ten on his own. Once these suckers were tossed in a paper bag full of powdered sugar, there was little to help us withstand the temptation of the finger-licking goodness of fried dough in its classiest form. Valentines Day 2015: The day Josh learned to butcher a whole duck. It was awesome. We pan seared the duck breasts and served them a l’orange. We then took the legs and wings and marinated them overnight before baking them in their own fat for several hours. 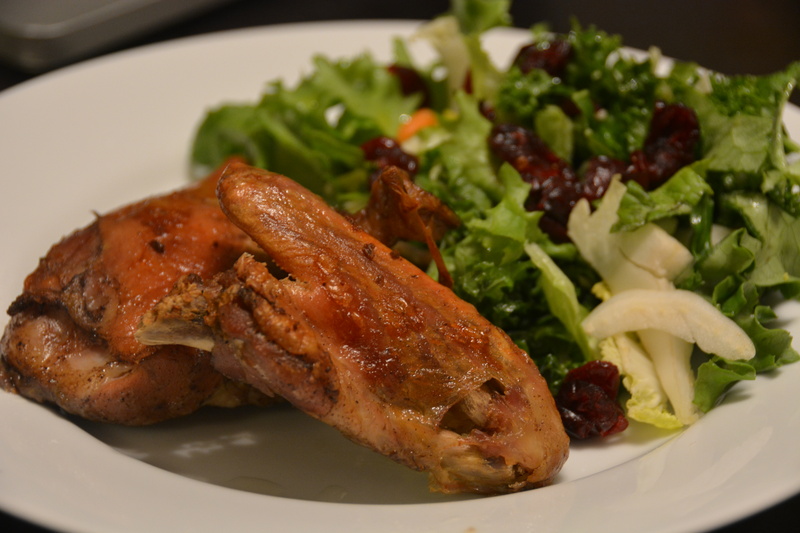 Following the David Lebovitz’s My Paris Kitchen book has not steered us wrong yet, and this confit recipe was no different. This was REAL food–you know that moment when you realize a combination of ingredients achieves something greater than the sum of its parts? Serious food. Seriously good.